When We (Me and My husband) visited Selvi aunty's home, she treated us with this delicious biryani. Many thanks to her for sharing this recipe. 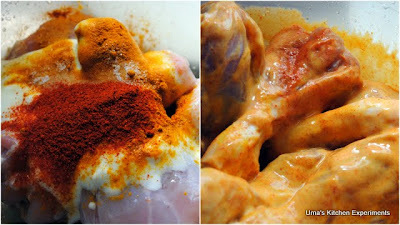 1) Wash chicken pieces well and marinate them with the given ingredients for marinate. 2) Keep in fridge for 30 minutes. 3) Mean while wash and soak basmathi rice for 30 minutes. 4) Grind ginger, garlic and green chilli to a paste and keepit aside. 5) Heat 2 tablespoon of oil in wide pan / cooker. 6) Add cinnamon, crushed cloves, cardamom and bay leaves when the oil is hot. Allow the ingredients to get brown. 7) Add onion and saute them till they are translucent. 8) Add ginger, garlic and green chilli paste and saute for 1 minute. 9) Add tomatoes and stir till the tomato completely mashes. 10) Add red chilli powder, turmeric powder, mint leaves , coriander leaves and salt. 11) Saute till the raw smell of everything goes well. 12) Add the chicken drumsticks to this and without adding water, stir in high heat for 4 minutes. 13) Again reduce the flame to low and cook till the chicken is well cooked. 14) Add coconut milk and water. Give a stir and then add rice. 15) Mix well and cover using a lid. 16) Cook till rice is boiled well by stirring occasionally. If you are keeping rice in Pressure cooker cover and wait for 2 whistles. 17) Serve hot with any raita. 1) Adjust the water quantity according to your rice type. 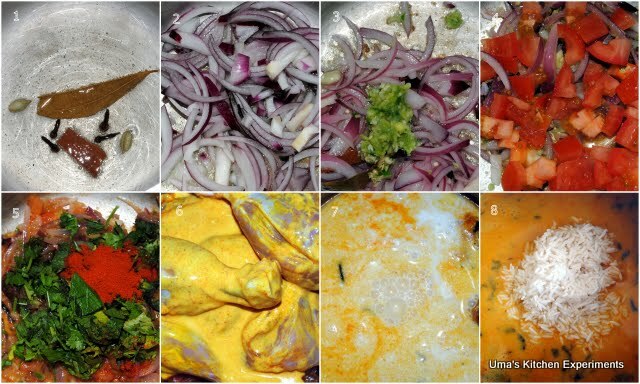 2) The yogurt/curd added with chicken reduces the spice level. so make sure to add more red chilli powder than the usual quantity. Sending this rice to Rice Recipes Event by Sameena. This sure is an awesome biryani.And I love the fact that its a one pot meal and even better, you can make this in a pressure cooker too. I love chicken biryani, this one looks terrific. Lovely looking chicken biriyani. Excellent texture. Lovely colour and looks fab.. I liked the addition of coconut milk in biryani. Looks delicious, flavourful and tasty. Wonderful presentation. Cooking biryani in coconut milk gives it a nice flavor...This biryani looks fantastic & so inviting!!! I have cooked biryani with coconut milk some time back.. Very flavorful.. Urs look too good.. Nice clicks.. Very exotic looking biryani with fabulous clicks! Comforting one pot meal can't stop with just a few servings. I had tried this one.. Very delicious and tasty.. Thanks for the recipe.. I want to try this. Which green chile do you use? Is it a fresh green chile like jalapeno, anaheim, poblano or is it canned green chiles? @ Bombon, I used fresh Indian green chillies. You can use any of those you mentioned except canned green chillies. Use of green chillies is based on the spice level you want in the biryani.